Many people collect letters, postcards, and stamps. Today is the day to celebrate the postal workers in your neighborhood. 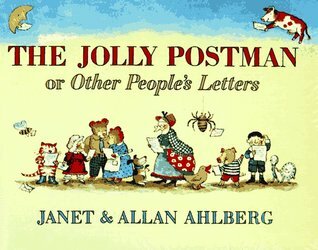 This is a classic collection of letters delivered by the jolly postman on his bicycle through the neighborhood of Once Upon a Time. Each page is an addressed envelope with a letter, card, or advertisement inside for the recipient. On each stop along the way, the postman delivers the mail and stops for a cup of tea while the recipients read their mail much to the amusement of the child reading the book. Mr. and Mrs. Bear receive a letter from Goldilocks, the giant gets a postcard from Jack, Red Riding Hood’s lawyer writes a letter to the wolf, and even the Wicked Witch who receives a mail order catalogue of witch necessities. 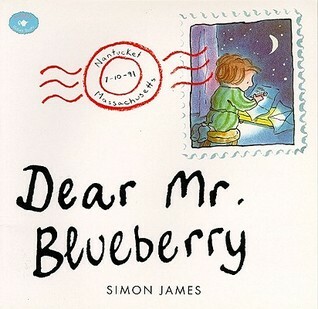 Emily and her teacher, Mr. Blueberry, exchange a series of letters after Emily finds a blue whale in her swimming pool. Mr. Blueberry tries repeatedly to convince Emily that whale do not live in swimming pools, but she persists in her belief. The story ends when Emily’s whale disappears on day only to show up again at the beach where she is vacationing. Juno’s grandmother lives in Seoul. She writes him a letter that he cannot read, but he knows what his Grandma says by what she includes in her letter. Grandma sends pictures of herself with her new cat and dried flowers from her garden. 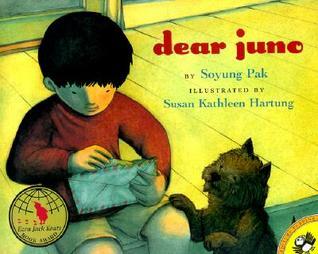 Juno decides to write a letter to his Grandma too. He sends the biggest leaf he can find and drawings of himself, his mom and dad, his dog Sam, and an airplane. His next letter from Grandma has a picture of her cat with two kittens, a box of colored pencils, and a toy airplane. Juno knows that Grandma wants him to draw more pictures with the colored pencils and that she’s coming to visit him by airplane.